Bismoline Medicated Powder was developed over 100 years ago. Formulated as a general-purpose medicated talcum powder, the product has not changed significantly since that time. It still coats skin with a protective film that aids in the prevention and relief of minor skin irritations. Bismoline has a loyal following in much of northeastern United States. Bismoline Manufacturing Company was founded by Acton Ash LeFevre, a pharmacist in Lancaster, Pennsylvania. After graduation from pharmacy college in 1894, he purchased a local drug store, renaming it A. A. LeFevre's Popular Price Drug Store "with prices as small as pin points." LeFevre originally formulated a medicated talcum powder about 1899. Three years later the Bismoline name was trademarked. A picture of his daughter appears on the first container in which Bismoline was sold. By 1915 LeFevre had moved the drugstore to a new location and had repackaged the product as "Bismoline, the original borated bismuth talcum powder" in a distinctive 3.25 ounce tin with an illustration of flowers. LeFevre died in 1927 and the drugstore was then managed by his widow, Fannie LeFevre. She soon sold the drug store to Elmer Bowman and Chauncy Longenecker who renamed it Queen Pharmacy. They became the sole distributors of Bismoline; however, Mrs. LeFevre continued to operate the Bismoline Manufacturing Company. She finally sold the manufacturing operation to Bowman in 1945. In that same year the familiar pink and blue container was introduced. Bowman's son, H. Robert, took over the business in 1974. In 1979 the company was purchased by Robert Schroeder, Arthur Keen, Martin Keen, and Irel Buckwalter. The new owners moved the business to 415 South Queen Street. A few years later, the office was moved to nearby 411 South Queen Street, where it remains today. Arthur Keen is general manager of Bismoline. 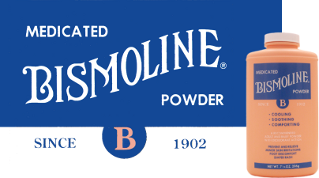 Recently the familiar metal container was changed to plastic, but other than the packaging, Bismoline utilizes the same formula developed by Acton LeFevre a century ago. One hundred years of soothing and comforting people - at a price everyone can afford - is an achievement few products can match.